I’m getting a few comments about the decline of the manufacturing sector. I love this topic because it allows me to riff off about those who don’t check their facts, as well as those who don’t understand economics. First of all, Manufacturing is not declining. The above chart shows industry gross value added (real). As you can see from the chart, Manufacturing has been growing around the same boring trend for the entire data set. It grows slower than the rest of the economy, that’s why it is shrinking as a proportion of GDP. Second, Manufacturers recently told us that they are feeling pretty good just now. 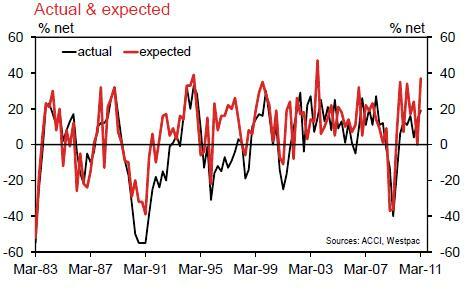 The above chart is from the ACCI-Westpac Manufacturing survey (a bit like the US ISM). The Q1 survey reported that Manufacturers were experiencing good times, and expected the future to get still better. Manufacturers also told ACCI-W that new orders were looking pretty good – and that they anticipated a spectacular improvement was expected in Q2. Perhaps new data will prove me wrong — as the AUD has got a bit stronger since Q4 / the ACCI-W survey. However I doubt it – things were going well at parity. I expect that the AUD will hurt some (import competing firms and exporters) however it will help some by lowering the cost of their imports (both inputs and capital equipment). Myself, i’ll be surprised if makes all that much difference. There are very few sharply non-linear results in economics – a 10% nomiinal appreciation is more likely to temper enthusiasm than trash. A tempering is what we ought to expect, and desire. Finally, even if manufacturing was contracting (and it’s probably not) we should not shed tears. Standard trade theory tells us that a relative price shock will expand the sector that benefits at the expense of the other sectors (in the link, it’s a two sector model, so think of it as mining and the rest of the economy). I think the problem with manufacturing is that no one can bring to mind something Australia manufactures. Hence why we irrationally think that manufacturing is shrinking. 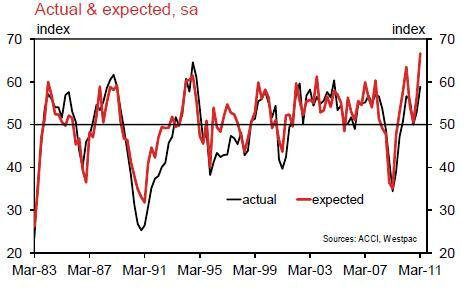 Australian PMI looks pretty sick to me. Contracting 7 of the past 8 months, and the effects of the AUD above parity are yet to flow through. Meanwhile, the flip side of the coin is the US PMI, which is in the 60s. 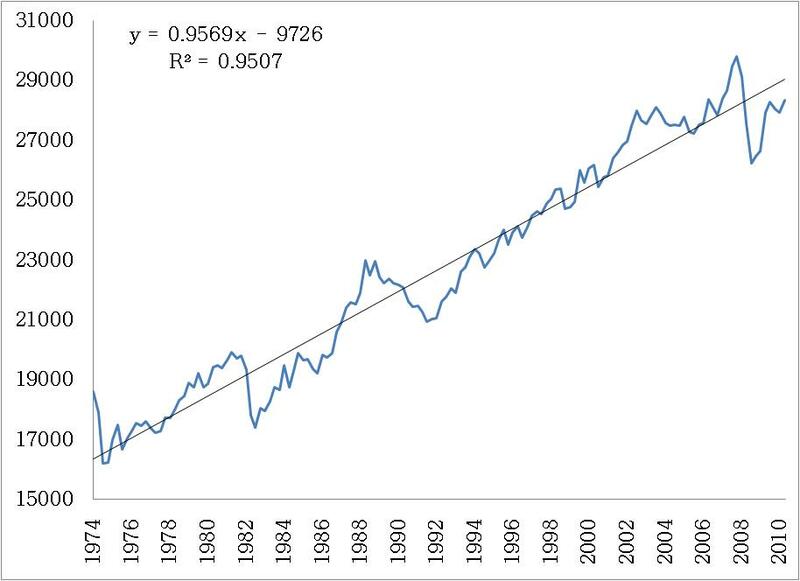 As for your first chart, zoom in on the last 8-9 years, ignore the GFC zig-zag, and the trend flattens out. Lets face it, manufacturing isn’t going to be zooming up past that trend line anytime soon with the dollar at $1.10. I love this topic because it allows me to riff off about those who don’t check their facts, as well as those who don’t understand economics. Dripping with condescension. Thanks for that. I needed to be put in my place. You’re not laying people off mate. Perhaps you’d shed some tears then? Look, this is a big structural change, and big structural changes are painful for a lot of people. People near the end of their working life with no hope of retraining to drive a mining truck. Some compassion might be in order. For all our sakes I hope China doesn’t blow up. All we hear these days is how fantastic the mining boom is for all of us. It wasn’t so long ago the Irish thought their housing boom was a great thing too. Is the ACCI dataset better than the PWC PMI? yes,there was strong growth in new orders, from 1 to 2.